Atronachs have made appearances in a few Elder Scrolls titles over the years, and are an important and prominent part of any play-through whether you choose to vanquish the creatures or use your powerful magicka to conjure them up yourself! The Flesh, Flame, Frost, and Storm Atronachs have all been seen before, but newer versions will appear in the Elder Scrolls Online. Let's have a look at the comparisons, but first, catch up with the rest of the series by clicking on the links provided below! Flame Atronachs are somewhat of a symbol, marking a lot of players first encounter with any sort of summoned Daedra. Found in games as early as Daggerfall, these Flame Atronachs always prove to be a daunting adversary, though they are inherently the least powerful Atronachs a player comes across. While lacking in background information, they are a wonder to watch in action with their impressive fire spells. Even after death, a Flame Atronach deals damage. The corpse explodes after a few moments of being stationary, injuring those in close proximity. They also can hold their own in close-combat battles, using their three sharpened fingers as deadly weapons. Previous Games: Dating back to the days of Morrowind, players saw male figures of flames adorned with minimalistic armour and pointed helmets. As years progressed, they took on a more feminine form in Oblivion and then shed their armour in Skyrim. However, we saw a different sort of Flame Atronach in Daggerfall, as they were defined as "Golems" and were constructed by mages. These Golems were very much in the likeness of man, but made of lava and flame. Elder Scrolls Online: Taking a page from the book of Skyrim, you can most certainly see the similarities between it's version and the Elder Scrolls Online version of the Flame Atronach. The differences are few and far between, mimicking the same sort of burnt flesh and horns we saw in Skyrim, but with more extended shoulder protrusions. Personally, I believe they look a bit more sinister than their predecessors, and are very well done overall. However, I do miss the intimidation factor of the hellish armour the Morrowind and Oblivion versions came equipped with. If it was incorporated somehow into this newer model, they would be perfect in this writer's humble opinion. Throughout my Elder Scrolls adventures, I've grown fond of these Atronachs in particular. Though I was never one for conjuration, I appreciated the unmatched beauty of the fiery figures and their relentless spell-casting. I hope to see them as mobs in locations congruent to their aesthetics (I.E Daedric Ruins or regions like Molag Amur) but not as conjurable creatures. In my opinion, they should be a rarity, and having them randomly summoned cheapens the feel of the Daedra. Hideous beasts constructed from cadavers and sewn together to create a malformed and terrifying creature, the Flesh Atronach made it's first appearance in Daggerfall, but is better known for it's role in the Oblivion DLC - "The Shivering Isles". These Frankenstein-esque monsters are technically Golems, but seem to be inhabited by Daedra. All Flesh Atronachs are entirely immune to poison and have a resistance to fire. Mangled and Torn Atronachs are also resistant to magicka, and Stitched, Sewn, and Mended all have spell absorption powers. The Gatekeeper cannot be paralysed and has a 75% magicka resistance. Previous Games: These ugly monstrosities are the epitome of what my nightmares are made of. Their skin is dead and sewn together, branded with strange markings and symbols. The Atronachs abdomens are ripped open, showing a strange illumination of yellow, red, or purple, and the same light is apparent on their foreheads, hands, and knees. They sport metal braces on their necks, wrists and ankles, and a larger one around their waists. The Gatekeeper is relatively similar, but much larger and more vicious. A sword, mace, or hammer is forged with one hand, making it a walking weapon. 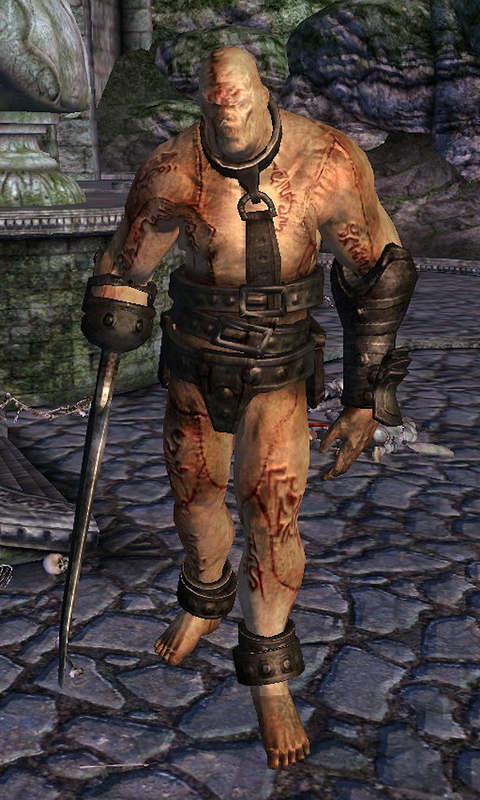 Elder Scrolls Online: While we have not seen the smaller Flesh Atronachs, the Gatekeeper is very much apart of TESO. The new version seems to be larger and even more hideous, which is a rather discouraging feature for this writer. The heap of flesh has a very dramatically hunched back and a menacing weapon attached to his hand much like the one seen in the Shivering Isles. We have seen the likes of an Elder Scrolls Online Gatekeeper, so that hope has already been converted to fact. Perhaps, not unlike Oblivion's Gatekeeper, the Flesh Atronachs will be guarding the Real of Sheogorath or another exciting prospect. The big, brutish, heinous monsters will hopefully be used as mini bosses in dungeons where as their smaller counterparts could be strewn throughout the depths of ruins. Maybe there may even be a side quest to do as we did in the Shivering Isles DLC and create another Gatekeeper! Since there is an unbelievable amount of information to cover, we will see the addition of both "Frost" and "Storm" Atronachs in my up-coming article related to this series. As usual, I do hope you enjoyed your time reading, so if you did, make sure you keep an eye out for "TESO Creature: Atronachs - Part 2". I really like this article, it is about a great topic. However, I believe that the Flame Atronachs look better without the armor, and it almost adds to the intimidation factor (puny, weakling, I don't even need to put armor on to destroy this mortal!) and adds to the effect of them being light hearted and agile, which I have always thought of them as. I am starting to notice a bit of a trend towards Skyrim in how TESO is making all of their creatures look. While this doesn't outright frustrate me, I feel like it's done just to appeal to the audience of Skyrim (since, I believe, over 10 million copies were sold of it). It causes for a bit more grief when you see such similarities to something as cool as these flame atronachs or the pictures I've seen in comparison for the other 2 atronachs of Frost and Storm. While I understand appealing to the consensus that Skyrim was a. . "good". . game that people liked and everything - I don't think it's very versatile and might could cause for a lot of repetition in the monsters we see in TESO. I would much rather like to see something like a male & female version of the fire atronach or flesh atronach. Possibly even one for the frost, although storm might not be possible. I don't think anyone wants to go into a burnt foresty area and just see a dozen identical fire atronachs standing around. That's very stagnant design, and causes the world's appearance as a whole to suffer. I would hope they invite a style of mob and creature design that is not so vogue. Something that impacts players to be surprised and terrified when they reach higher levels to fight this much more powerful form of a Flame Atronach. Alternatively, make it to where these two or three versions of the flame atronachs in the field have differences. Their statistics don't even need to change, but it is in the fact that their appearance has changed that gives people the idea that their statistics have changed. It mind-melds players into thinking one thing and doing another, causing for a different experience in a specific area, and very well the entire game as a whole. You could make it more in the likeness of a golem as its level increases, or make the armor on it more styled and dramatized. Something that can grant players the ability to fight the same monster more than once, but not feel like they are all copy-pastes of some original design. Hell, even making the flame on the fire atronach blue or some other color could work for starters. Anything that allows players to see the creature and be like, "This isn't what I'm used to. I need to think up a new strategy for this newer form of this monster." In the end, I understand that is a lot of extra work overall, but it is something that I would hope they put some time into for, if anything, the Daedra as a whole. They serve a very vital part of Elder Scrolls lore, and to make them a dull experience visually (Like making every flame atronach look the same from 1-50) is going to lessen the experience of fighting such daedra that are known to be so fun to fight. Granted, I can understand the argument against this that this is exactly what the other Elder Scrolls games have done. . to a point. The Clannfear and Scamp grew in size at higher levels and were re-introduced in Oblivion if I recall. Even so, variety wins in my book over vogue in every game. I don't know many who'd disagree with seeing many more designs than just these good looking atronachs. (November 9th 2013, 09:04 AM)Kilivin Wrote: Great article though, Blythe! Thanks Kilivin! Your reply was very well thought out and certainly attention grabbing. I would love if they were to implement some of your suggestions. It would certainly make the game come alive as a more immersive and realistic world. I also see your point: While it will be nice to be able to link a Skyrim monster to one from TESO, when majority of the mobs are taken directly from Skyrim's art direction it will quickly become boring. New takes on old mobs is never a bad thing. (November 9th 2013, 09:04 AM)Kilivin Wrote: even making the flame on the fire atronach blue or some other color could work for starters. Anything that allows players to see the creature and be like, "This isn't what I'm used to. I need to think up a new strategy for this newer form of this monster." Ah, didn't know if that was released information yet. . I played the stress test so I knew, but I just want to see more of that. Less repetitive monsters that all look 100% identical to one another. I'd rather fight 1 dreugh then 5 identical dreughs in the end if they are all going to look, fight, and act the exact same way. I would much rather like to see something like a male & female version of the fire atronach or flesh atronach. Possibly even one for the frost, although storm might not be possible. I don't think anyone wants to go into a burnt foresty area and just see a dozen identical fire atronachs standing around. That's very stagnant design, and causes the world's appearance as a whole to suffer. Something that Dead Rising 3 is doing that I really like is that they're putting their zombies on a dice-roll aesthetic system instead of just making a bunch of different models and throwing them in there. Each zombie will have a dice-roll generated design. An option of x kinds of pants, x shirts, x shoes, x missing body parts, etc. I think this would work wonders if it was used in bigger games like TES games. Just to keep it fresh. How hard would it be to put in to their code a couple different sets of arms, legs, bodies, heads, and different colors, red, orange, yellow, and blue. So few Atronacks would look alike that you would be hard pressed to remember the last time you saw the same combination. But then I don't do computers so I don't know how hard it would be. They look great, but a little variety would go a long way.